I turn into a sugar monster, leaving the store with an extra fifteen thousand calories in tow. Unfortunately for me, I have only successfully made caramel apples once, long ago, before I had a place to share beautiful food with you. Once. Nevertheless, my caramel apple cravings don't cease. Every year I give them another try, if not twice or thrice, hoping this will be the year they turn out. I can gather the apples, freshly picked from trees, and buy copious amounts of sugar and chocolate, but I can never seem to get the caramel to hug the apples. Instead, it sinks to the bottom of the apples forming sweet, mournful puddles. The recipe doesn't seem to matter, nor does the intensity in which I watch the mercury rise in my candy thermometer. Perhaps I am cursed, never to produce beautiful caramel apples again (though beautiful or not, those sweet apples are promptly devoured anyway). So this year, after my caramel apples failed to turn out yet again (curse you, caramel apple gods! ), I turned to new ideas and recipes to share this flavor combination with you. Perhaps the saving grace to come out of this sad situation is that, if I didn't have such poor luck with caramel apples, these gorgeous tarts may have never been born. Now that would be truly devastating. The world needs more cinnamon apples drowned in an orange citrus caramel overflowing a sweet, almond shortbread crust. Don't you agree? 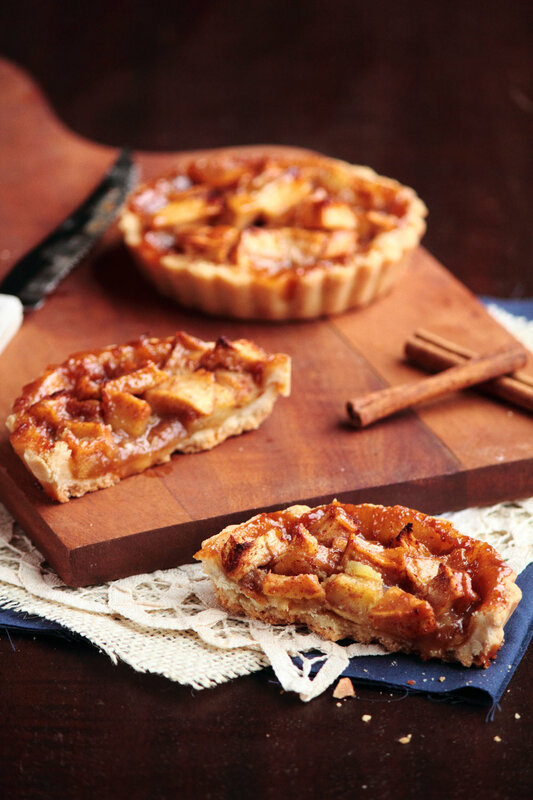 These Caramel Apple Tarts are a perfect treat served warmed on a cold fall day. Apples are coated in cinnamon and orange zest before being covered in an orange citrus caramel and set in an almond shortbread crust to bake. 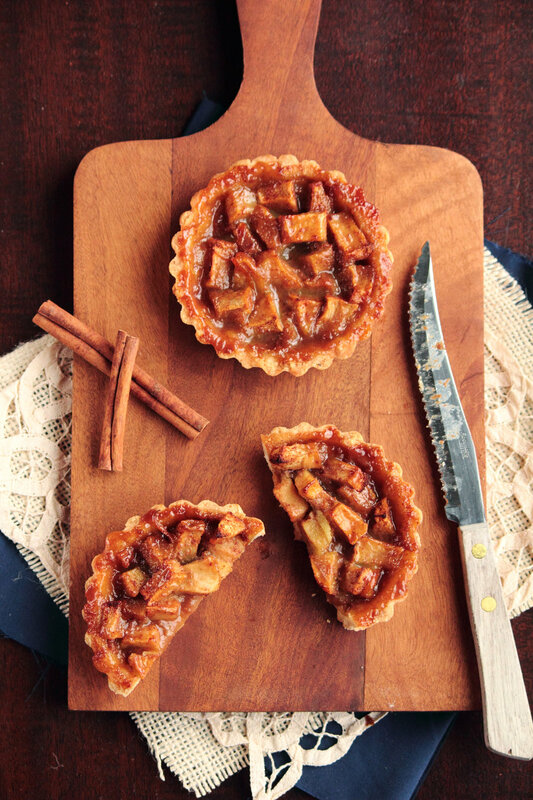 The hint of orange really lends a greater depth of flavor to these tarts. Though the recipe may appear intimidating in length, the steps are not difficult. I simply went into greater detail than usual to help you along the way. In a food processor, blend the butter until smooth and creamy. Add the powdered sugar and process until well mixed. Add in the almonds, salt, vanilla extract, and egg and process again. Scrape around the bowl if necessary. Add the flour and pulse just until the dough forms a ball. The dough will be the consistency of very soft and sticky cookie dough. Remove the dough from the bowl, shape into a disk, and wrap in plastic. Chill in refrigerator for 4 hours or overnight to firm up the dough. When chilled until firm, roll out the dough on a lightly floured surface until it is 1/8-inch thick (you may have to wait a few minutes for the dough to soften). Cut out rounds of dough to fit the tartlet pans (alternatively, if you are making a large, single tart, roll out the dough and cut a large circle to fit the tart pan). Press the dough carefully into the pans; be careful not the stretch the dough! Stab the bottom several times with a fork so the dough will not rise in the oven. Bake the tart shells for 15-18 minutes, or until they are lightly colored and the shell feels dry to the touch. Let cool completely before filling. In a large saucepan over medium heat, mix together granulated sugar and 1/4 cup water. Scrape down sides of pan and let sugar boil, without stirring, until sugar reaches a golden amber color (if using a candy thermometer, this happens somewhere between 325F to 350F). Remove sugar from heat and allow to rest for a full minute before pouring in warmed heavy cream. Whisk vigorously to incorporate cream (caramel will bubble up violently so be very careful!). Whisk in orange juice and salt. To store, keep refrigerated in an air-tight container. In a medium bowl, combine apples, orange juice, orange zest, and cinnamon. Spoon apples into baked and cooled tart shells (apples will cook down while baking so pile them high). Pour caramel over each tart until it reaches the rim of the shell. Place tarts on a parchment lined baking sheet (do not skip this!) and bake for 30-35 minutes, or until apples are tender. Allow to cool for 15 minutes on pan before attempting to move them (the caramel needs to harden up slightly or the tarts will crumble under your fingers). Serve slightly warmed, with a dollop of whipped cream if desired.